‘She’s so good at playing the violin, she’s practically Asian!’…a line from fiery Gabrielle in an episode of Desperate Housewives where she suffers from competitive mum syndrome! Tiger Mother was the hot topic at the latest Book Club meeting (I know I say it each time, but it was another great get together with good people). Parenting is so very personal and once shared with a wide audience can be contentious and critique comes easy…we all have our own style, traditions, beliefs, etc. and any attempt to coerse parents to take on your methods is dangerous ground. But I don’t think this was essentially Amy Chua’s purpose when she wrote her journal of family life. I must say I admire her devotion and determination, but can’t help wondering if this came at a price. Her willingness to share so openly her ‘tiger’ parenting, and as such to invite readers to form an opinion about her family life is awfully brave. Look out for the next Book Club read…The Help by Kathryn Stockett (already made into a movie due out this summer). The Artist and I recently had the opportunity to see The Tiger Who Came to Tea live on stage before it runs in London during the summer and I urge you to book tickets now! The book (first published in 1968) is a firm favourite at the Headmaster’s House and Judith Kerr’s illustrations are delightful. This article from The Telegraph provides great insight into the life of a most fascinating lady and I can’t wait to see her new books about The Great Granny Gang! Congratulations to Julia Donaldson, the new children’s laureate! We had the great pleasure of meeting Julia Donaldson at a recent performance of the Gruffalo when she and her husband Malcolm invited the children to join them on stage to act out some of her brilliant books and songs. She was absolutely charming and dealt with the somewhat rowdy young crowd with expert grace and patience. I found it quite emotional when all the parents and children were singing along to a Squash and a Squeeze…I have enjoyed reading aloud from any of the Julia Donaldson books from day one of our family life and am in awe of her generosity when sharing her gift for rhyme and writing. Julia Donaldson is a hero of literature, aha oho…we are in for a treat as she takes up the role of children’s laureate! Last night’s meeting was a great success. We were low on numbers but this didn’t matter a bit. That’s not to say we didn’t miss our regular dear readers! Really looking forward to catching up in May (see the reading list below). 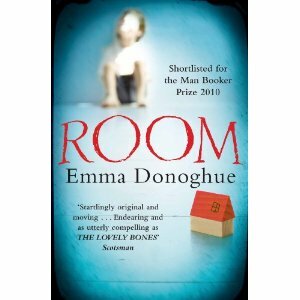 We delved deep into the book and our discussion raised lots of strong opinions and thoughts about Room by Emma Donoghue. The book was shortlisted for the Man Booker prize last year and has featured on many book club reading lists…have a listen to the author discussing Room on the Radio 4 Front Row programme. What a book! An incredibly disturbing and desperate subject matter; a small boy and his mother trapped in a room with no access to the outside world and all this is set in the mind of a five year old. The narration is unique and the grammar takes some getting used to. Some readers raced through parts of the book to see how the story unfolded and then other times found themselves tempted to skip through pages to avoid the horror of their confinement. The author, Emma Donoghue suggests that Jack’s innocence filters the horror and he sets the terms of the story. Despite the confinement this book is ‘uplifting’; as the story develops you get to know Jack and Ma and their unique mother-son relationship. Ma is intensely protective of Jack; the author brings to your attention the powerful force of nature that exists to protect your child no matter what the circumstances. A few readers felt the author’s message was somewhat forced at times and I think we all agreed we were not entirely certain we would recommend Room to a friend. But as a reader reminded us last night…one of the features of our book club is to read titles we may not normally pick up at the bookstore! Personally, I put off reading Room purely because of the subject matter, then I toughened up and read the book in two days…grabbing any free moments during a weekend to get to the end! I am fascinated by books and stories that push our imagination and how real some can seem…in this instance my protective nature rose up and stopped me imagining what it would be like to be in the place of Jack and Ma. Room was both easy and difficult to read, as ever I am impressed by an author’s achievements and grateful that Room lead to a brilliant book group discussion! The best-selling author of Sister joined our Book Club last Monday. We were delighted to welcome Rosamund Lupton and very keen to hear all about her debut novel which took several years of research, writing and some re-writing, and plenty of determination to reach the prized 3 for 2 tables at Waterstones. Just days after Sister was published in September 2010, it was picked for Book at Bedtime on Radio 4. The book became the fastest-selling debut novel at WHSmith and was voted the best book of 2010 by Richard and Judy Book Club readers. Hats off to Rosamund for her achievements, persisting with a story she believed in…I wonder if any of the book group feel inspired to write after hearing Rosamund’s story?! We all agreed that Sister was a compelling story; a superb combination of great characters, complex relationships, intriguing storyline and a brilliant twist at the end…all in all a terrific read and one the group would highly recommend. Look out for her second novel, Afterwards, to be published in June and at this same time Sister will be available in bookstores across the Atlantic. We wish Rosamund every success and look forward to welcoming her again to Book Club. Through the Narrow Gate is Karen Armstrong’s intimate memoir of life inside a Catholic convent. With refreshing honesty and clarity, the book takes readers on a revelatory adventure that begins with Armstrong’s decision, at age seventeen, to devote herself to God. What she discovers in the course of her spiritual training offers a fascinating view into a shrouded religious life, and a vivid, moving account of the spiritual coming of age of one of our most loved and respected interpreters of religious faith. For more book club news and reviews have a look here.